Pity the owners of luxury London flats who may previously have had to slum it when they got to the office. While developers have been adding more and more opulence to residential buildings, workplaces have been left behind, according to Simon Lyons, joint chief executive of Enstar Capital. The directors’ suite. Looks echoey. But not any more. 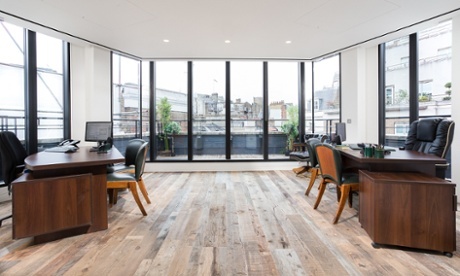 His firm has just spent £3m fitting out an office building in Mayfair – the equivalent of £500 per square foot – which it claims is the most expensive overhaul in the capital. Employees at the building, situated at 54 Brooks Mews, will be surrounded by the latest in mod cons and luxury. 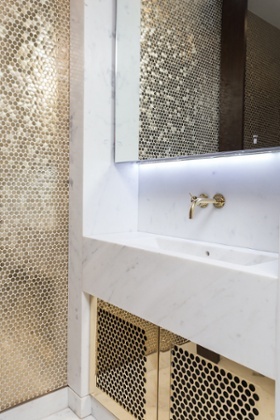 There are “gold” washrooms designed to look like those in Milan’s Armani hotel; pre-programmed, switch-free lighting; and in-office dining provided by the restaurant La Petite Maison. Instead of the traditional static-inducing carpet tiles of offices around the country, the building boasts timber flooring imported from a 16th-century Tuscan monastery. And if you need somewhere to eat your packed lunch, there’s a rooftop terrace to sit on. Lyons said: “Offices should be as good as homes. Local business people think nothing of spending £5m-£100m on a Mayfair home, spending hundreds of pounds per square foot fitting it out, yet will work nearby in offices which are nowhere near the standard of luxury or quality. The 2,000 sq ft offices on the first and second floors will each let on a five-year lease at £250,000 a year. The £125 per sq ft rent is more than the £95 per sq ft average for Mayfair, and the £60-£70 per sq ft typically paid in central London. 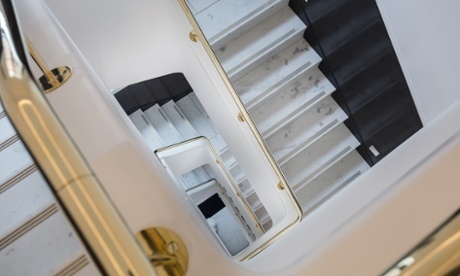 The marble stairwell. What, no lift? Little wonder then, that the developers have a very specific client-base in mind. The offices are apparently perfect for hedge funds or the “private family office of super-rich Middle East/Asian royals or business people”, and will be marketed to “Saudi royals, family of the sultan of Brunei and Qatari royals and relatives”. Details of how they will run the office tea round are unconfirmed.